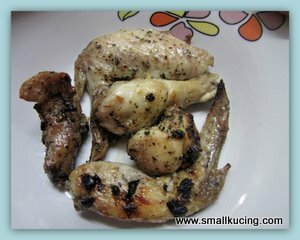 SMALL KUCING: Grilled Lemon Pepper Chicken and The Green Tiger. 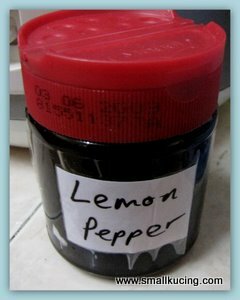 The other day, Veron, Quay Po Cooks gave Mamarazzi a bottle of her homemade Lemon Pepper. Mamarazzi finally try out the Lemon Pepper. Bought some Chicken wings and sort of pour some of the herbs on to the chicken wings. Smell very good while it was in the oven. Opppsss...a bit hangus when it came out. But it tasted very good. Papa said next time must put more Lemon Pepper onto it. Thank you very much Auntie Veron! By the way, anyone of you have green fingers? You might like to check out this terrific blog. This The Green Tiger Blog is really awesome. What would you think if you see your neighbour put a bath tub in the garden? That the neighbor planning to take a bath there? Wanna know the answer? Just pop over to The Green Tiger Blog and see. Aisk..got white and black chicken wings..LOL! Small Kucing, your food postings always makes me hungry! Thank you for the shoutout for 'harimau hijau'! wow....chicken wings. My favourite. yummy! lemon pepper = lemon + pepper? Good attempt thought I have not heard about the sauce. Lemon and pepper, sound so yummy already! Oh no chicken wing.. I like chicken wing.. the BBQ one is the best. Do you think that? 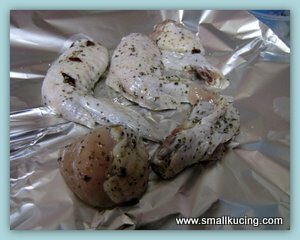 Small kucing, glad you all like the taste of lemon pepper! Yes your paparazi is right can put more, more tasty.